The lovely, vine-draped, 'Casa Luna' (House of the Moon) offers a wonderful tropical experience. 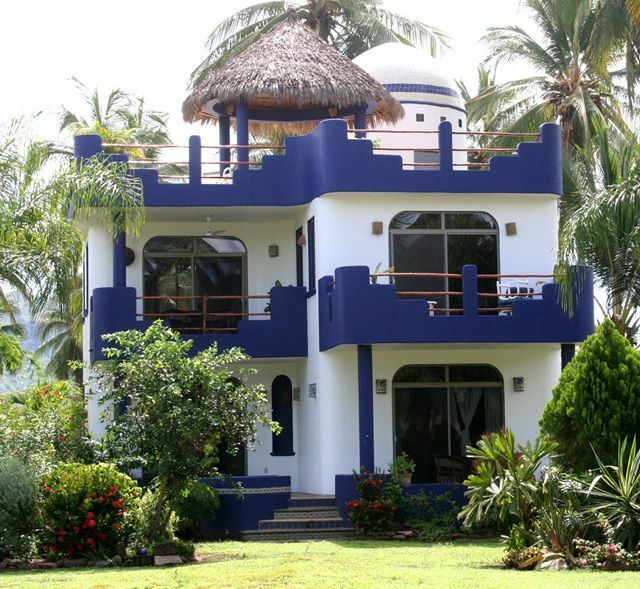 Casa Luna is one of 10 beautiful Villas for rent at Playa las Tortugas. We are situated on an old coconut plantation. Fresh coconuts cut for you at your request! Playa Las Tortugas lies on the west coast of Mexico just 70 miles north of Puerto Vallarta and the Bay of Banderas, in a setting with miles of sandy beach on our south and hundreds of acres of mangrove estuary on our north, nesting habitat for sea turtles and more than 125 species of birds. Your scenic drive north through areas of old-growth jungle which border the coast is simply spectacular. Before arriving you might select a variety of fresh fruits and coconut products in stands along the road. Optionally we can arrange for transportation for you to and from the airport, and meals prepared by our wonderful cooks can be arranged. Our Casa Luna is the perfect spot for a relaxing vacation. It is nestled amidst palm trees and beautiful gardens. Listen to the surf as you have your morning coffee, or fall asleep to gentle waves at night. Each of the two king bedroom suites is decorated with rustic furnishings from the artisan community of 'Tonalá. Sliding doors open to three different patios with views of the coconut palm grove and gardens to the beach. The suites are complemented with colorfully tiled bathrooms. King-sized beds, desks, and ample closet space and drawers help to insure your comfort. The main floor is comprised of living room with additional sleeping for two, dining area, a well-equipped kitchen , breakfast bar, and a half-bath. All designed for your convenience in your vacation home. Take the opportunity to enjoy a traditional meal prepared by one of our cooking staff, or make yourself at home in our complete kitchen. Individual shaded terraces, with that 'big blue' Pacific ocean view, connect to the living and dining areas providing a nice space for a relaxed breakfast or afternoon nap. Up above you'll find a peaceful terrace that spans the entire rooftop, with its own woven-palm shade 'palapa', with overhead fan. Take your favorite book and beverage. Listen to the surf, and the sounds of the many birds. It is also the perfect spot for sunbathing, grilling lunch or dinner and watching a spectacular sunset. Add a margarita or piña colada and every element is in place for the perfect tropical vacation. We also have a brand new clubhouse with a lap pool for your enjoyment. You can visit small typical Mexican villages, enjoy fresh fish and other local seafood at small rustic beachfront restaurants, tour a tropical river and waterfalls, see historic San Blas, and drive up through the foothills of the Sierra Madre mountains to colonial Tepic where crafts of the Huichol Indians are found. We have many add on excursions for you to enjoy...not the least being a relaxing massage under the rooftop palapa! We are happy to arrange transportation for you in our private shuttle, you may rent a car and drive your self which a large number of our guests do, or if you'd like to be more adventurous you may decide to come by bus and local taxi. We can send you details on the numerous car rental companies, or instructions on which buses and local taxis to take. It's quite easy to find your way from the Puerto Vallarta (PVR) International Airport to Playa Las Tortugas, and the roads are normally well-maintained. Your valid driver's license is accepted in Mexico, and the driving rules are virtually the same as most countries. Write us for a copy of detailed driving instructions and a map. Your scenic drive north from the airport takes less than 2 hours and goes through areas of old-growth jungle and coastal hills. Visit us to enjoy miles of warm tropical sand beach at Playa Las Tortugas, Riviera Nayarit, Mexico! Andale!! We met in Mexico 34 years ago. It took until 2001 to find the perfect place! We have 4 grown kids, recently moved from Truckee, CA. to Reno, NV. and spend at least 2.5 months down at our lovely Casa Luna. Plan to retire at least half time at PLT in the near future. Casa Luna is the only place where we can spend time at and Not need a vacation when we get back to our home in the US. We looked for a long time to find a place in Mexico...in various areas. The developer of PLT had a real vision when this place was built. It is pristine and quiet...no vendors to hassle us and every villa has a wonderful view of the ocean. It is an eco friendly resort, and the efforts to rescue endangered sea turtles are just outstanding. Peace and quiet. Read those books you've been putting off. Enjoy your family and friends. Everything slows down so you really enjoy your surroundings! toilet, With sink, located on middle level, off kitchen. Two full bathrooms attached to each bedroom. Half bath on main living area. Lovely ocean views from 2nd and 3rd levels. Some laundry included in rental fee; other laundry service available upon request. Tv, dvd player, ipod deck w/speakers. Large dvd and book library. Board games for children and adults. Seating for 6-8, plus trundle bed that is doubles as additional sleeping. Service for eight, plus serving dishes, pitchers, etc. with all cooking accessories, Blender, Coffee Grinder, Coffee Maker, Paper Towels, Spices, Toaster, Microwave, Juicer. Adjacent to kitchen. Additional dining area on covered kitchen deck and also upstairs under rooftop palapa with ceiling fan. Boogie boards, some children's sand and pool toys. Extensive video library (over 70) for adults and children. Lovely flowering gardens surround the villa. 2 decks and rooftop palapa area. Minimum of two boogie boards for guest use. Large pool with shade 'palapa' for Playa Las Tortugas villas. Many lounges and umbrella tables. Shallow wading area for small children. There is also a new clubhouse with lap pool. Activities Guide, Local Activities, Local Maps, Bottled Water, Canoes and kayaks available for nominal charge, Ceiling Fans, Cook available, Daily maid service, Dining Room Seating for 6, Gardens: Private and large common area gardens with hundreds of tropical plants, Housekeeper Included, Internet high speed wireless available for nominal charge, Iron and Ironing Board, Lounge Seating for 6, Massage available (extra charge), Outdoor shower, Patio, Private Palm-Roofed Palapa, Large Tiled and Partially Covered Sunning Terrace, Pool: Large pool with palapa for the homes at Playa Las Tortugas, Private cook available, Restaurant dining guide, Soap and toilet paper provided, beach towels provided,hair dryer. Walkway to Water, Pets considered with owner approval. Smoking Not Allowed: No smoking inside please! Thank you for your lovely and descriptive visit to Playa las Tortugas and Casa Luna. I am so pleased you and your family enjoyed your stay at my villa. I am currently in Casa Luna and the peaceful feeling is quickly coming over me. You were a wonderful guest, please come back to visit soon! Casa Luna is wonderful. Ocean and beach right outside the front door. Endless miles of empty beach to discover. Truly amazing home with everything you need. Las Tortugas is a long way from a town so stock up on supplies in PV at Mega store before coming down. Thank you very much, Tonya, for your kind review. I am so happy you and your husband enjoyed your stay at Casa Luna! Playa las Tortugas is indeed a very special place. Away from the crowds; your own little paradise. Thank you, Kate, for your lovely review of our Casa Luna! We try very hard to make things perfect for our guests and it looks like we succeeded. Gorgeous views, lush grounds, pool 100 feet away, beach 200 ft away, releasing turtles, with nice comfortable housing with all the needed amenities...the trip and stay couldn't of been better. The property was so relaxing that i never wanted to leave. It was a great escape from the roller coaster of every day life. I highly recommend Casa Luna as me and my family had a great time at this beautiful property! Thanks so much for your great review, Brian! We love it when our guests enjoy their stay in our Casa Luna. Casa Luna came highly recommended by a friend who stayed there last year. We owe her a very nice bottle of wine! I am reluctant to post this review as I want it to be vacant for next year's vacation! The house and grounds are immaculate, and the staff are accessible, helpful and friendly. It was exactly as advertised. The beach is incredible; stretching for miles without another soul in sight! Be prepared for total isolation though... no restaurants, stores or beach vendors for miles. Very quiet and relaxing, which is exactly what we were looking for. We arranged for airport pick up and drop off, which I would recommend for your first time as finding this gem on your own in the dark could prove difficult. Next time we will rent a car so we can explore the area or replenish supplies ourselves when we run out. We also had fabulous dinners cooked for us, but again with a car we could have had a few simpler meals and also picked up a few steaks, mix and more wine as we ran out. All in all, one of the best vacations ever! Highly recommended. Thank you for your great review, Dan. We try to make your vacation a good experience and sounds like it was! There are some restaurants (beach front palapa style) across the estuary.So be sure to try them on your next visit! Our staff will also pick up any provisions that you run out of. I agree that renting a car can expand your experience once you've got the lay of the land! There are many nice places to explore. Thank you also for being such wonderful guests. We welcome you back at any time! Casa Luna was just as described. It’s a lovely and well maintained house, the perfect quiet family getaway. Marriane was very thorough with info and quick to get back to me for any questions I had. All of the people working at Playa Las Tortugas where also really friendly and helpful while we were there. We hope to visit again! Thanks, Cheri! So happy you and your family enjoyed your stay at Casa Luna. Love to have you return, you are an excellent guest! Second payment for Holiday reservations is due 90 days prior to arrival. If reserved less than 90 days in advance, full payment is due at time of booking. Full refund, minus $100, if reservation cancelled more than 45 days prior to arrival. Full refund, minus $100, if HOLIDAY reservation is cancelled more than 90 days prior to arrival.